In choosing an estate planning attorney, you want to be extremely thorough. This is someone who will be handling the ownership of your personal belongings for the remainder of your life and beyond, so it is incredibly important to hire someone you trust to take care of you. Steve Rausch, of Capital City Law is in his 15th year of estate planning and business law practice. He has seen the ins and outs of estate planning, and knows that finding the right estate planning lawyer is something to take seriously. This blog is a guide for how to find the right estate planning lawyer for you. Read on to learn more. When planning your estate, the truth is, that you don’t have to hire an attorney. You can create the necessary estate arrangements on your own, however the process is often complicated and confusing. The more assets you have, the more complicated and confusing it is. It is a smart idea to hire an estate planning attorney, so you have a professional who knows how the process works, and can help you create the estate plans as you wish. When you decide to hire an attorney, the first thing you should do is compile documents and information about your assets. When you compile all of your information regarding your property, you’ll want to think of who you want to have ownership over it, and how much (roughly) your assets are worth. After you decide to hire an estate planning attorney, and have gathered information about your property, you’ll want to begin pursuing the search for the right estate planning lawyer. There are two sources that can give you trustworthy recommendations on a quality estate planning lawyer. The first are trusted friends or family members. Taking a recommendation from someone you trust is a great choice. Be wary, however with people who could potentially be in your will. They may try to sway you one way or another in their recommendations in order to get a larger share of your assets. The second source is another law professional. If you utilize the expertise of an attorney for other matters, it is wise to ask them for recommendations. They should have a good understanding of the other attorney’s experience and professional reputation. Before meeting in person, schedule a brief preliminary phone consultation. These kind of consultations take up less time and require less effort than in-person consultations. This will help you be able to talk to more attorneys and narrow your search to a few potential candidates. Before you meet with your potential candidates in person, they may give you a list of information they need to be able to evaluate your case. It’s a good sign when your potential attorney gives you a questionnaire or goal form to send back before the meeting. This is a good indication that they take your case seriously and want to get to know you. Once you have narrowed your search to a few potential candidates, it is time to meet them in person. A good tactic is to interview at least three in their offices. This is a great opportunity to get to know them, ask them all your questions about your assets and the estate planning process, and get a better idea of what it would look like to work for them. Most attorneys offer a free or low-cost initial consultation. You’ll want to double check this to make sure that you’re not being overcharged. When you’re meeting with an estate planning candidate in person, it’s beneficial to ask questions about their practice. You want to be sure that they are trustworthy and that they will treat your case with the attention and care it deserves. A worthwhile estate planning attorney will be able to explain the law, and your options in a way that you understand. Your estate planning lawyer is someone that you’ll be working with, and sharing intimate details of your life with, potentially for the duration of your life, so it’s critical that you like and trust this individual. Make sure that they’re truly listening to you and are interested in what you have to say and make you feel comfortable. Sometimes attorneys won’t disclose their fees prior to your appointment with them. It may be difficult for attorneys to quote you an exact fee without knowing the particulars of your case. However, it’s not impossible for them to give you an estimated fee range, so you’re not left in the dark when it comes to what your attorney will charge you. At the same time, be careful of attorneys who quote a fixed fee without looking at your case. This is an indicator that they give everyone the same estate plan instead of meeting your personal needs. 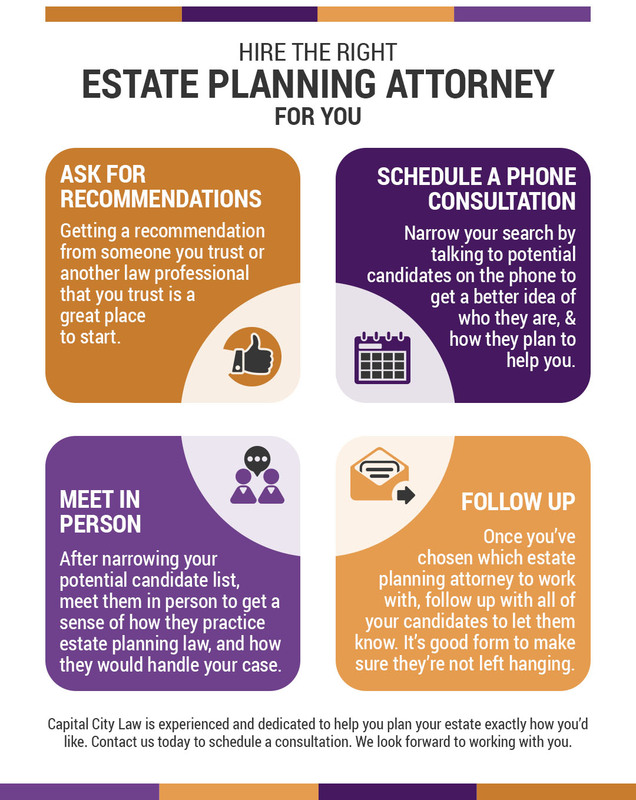 Once you’ve met with several estate planning attorney candidates, compare your notes about each of them. The one you feel the most comfortable around, and know that you can trust is your best bet. It’s important to understand that the cost of hiring an attorney is not your only concern. Once you have chosen an estate planning attorney, it’s important to follow up with the ones you talked to so that they’re not left hanging. This is also a great way to get more questions answered from the estate planning attorney you decided to go with. Capital City Law’s experienced law team focuses on estate planning and trust and will-based planning. You can trust us to give you the power to control your own assets. Call us today to get started.